The effects of globalization have driven incredible revolutions within the learning organization. The alteration is so forceful that the educational system has to keep itself abreast with the most recent developments. The existing dilemma in education has lead to globalization of the education sector. 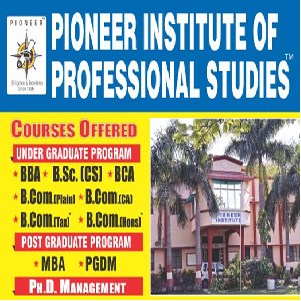 To congregate world-class competencies in our potential students, we at Pioneer have launched exclusive and distinctive programs through extracurricular activities. The curricular activities offered by the Institute facilitate the students to an overall personality transformation, training them to be better managers, and better individual. The meticulous syllabuses not only instill in them, an obsession for information but also attempt to prepare them how to submit the application to real-life situations. The programs positions stress on well-formed personality improvement of the students and also in inculcating the standards of collaboration and respectability in them. Web based learning system, fast growing use of internet, importance of video conferencing in learning and research are considered these days as a common practice in the myriad developing fields around the world. The aim is to impart strong professionalism in thinking and performance. This is an indication of our accomplishments and we are on our way to perfection.